The adjustable comb gives you a custom fit. A legendary firearm, supremely crafted, priced to own. 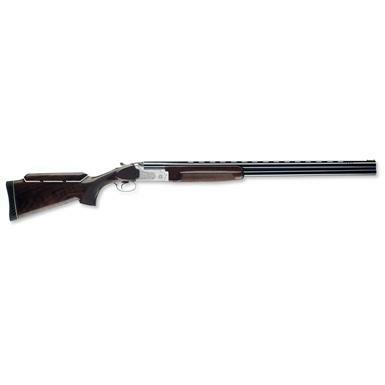 The Model 101 Pigeon Trap is built to compete with the finest guns on the market. One look and you'll think you're going to pay a pretty penny for a firearm this well balanced, this solidly built and this gorgeous. This Belgian-made over / under boasts an unshakable action that had 25,000 shells ran through without a single part failure. The low-profile receiver and mild recoil, combined with its fast-handling performance makes this a real treat to shoot. The beautiful Turkish walnut stock, engraved steel and finely cut checkering make this over / under worthy of a spot on your wall, right next to all your other hunting trophies. Overall weight: 7 lbs., 8 oz. Browning BPS Trap, Pump Action, 12 Gauge, 30"
Gold-medal trapshooting performance for smaller-framed shooters. A masterwork of style and performance.